CAIRO (AP) — Islamic State militants in Libya shot and beheaded groups of captive Ethiopian Christians, a video purportedly from the extremists showed Sunday. The attack widens the circle of nations affected by the group’s atrocities while showing its growth beyond a self-declared “caliphate” in Syria and Iraq. The release of the 29-minute video comes a day after Afghanistan’s president blamed the extremists for a suicide attack in his country that killed at least 35 people — and underscores the chaos gripping Libya after its 2011 civil war and the killing of dictator Moammar Gadhafi. 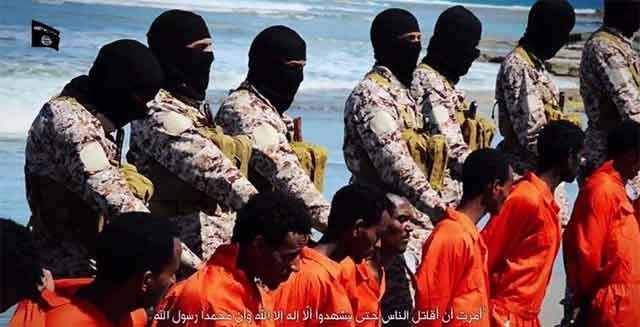 It also mirrored a film released in February showing militants beheading 21 captured Egyptian Christians on a Libyan beach, which immediately drew Egyptian airstrikes on the group’s suspected positions in Libya. Whether Ethiopia would — or could — respond with similar military force remains unclear. Ethiopia long has drawn the anger of Islamic extremists over its military’s attacks on neighboring Somalia, whose population is almost entirely Muslim. While the militant in the video at one point said “Muslim blood that was shed under the hands of your religion is not cheap,” it did not specifically mention the Ethiopian government’s actions.